Taxi Cab, City Taxi and Taxi Express has entered into a Taxi Alliance with us. Together we dispose today of eight taxis and we can now offer our services to even more customers. We apply price guarantee, which means that you as a customer in advance to find out what the maximum journey will cost. Always fixed price from Ängelholm Airport to Helsingborg. Our drivers have gone through a solid education regarding local knowledge, CPR, fire safety, customer service, etc. When you call us, our telephone exchange will give you an estimate time until the car comes. The alternative is that the driver on his way to the address calls the customer and give information. 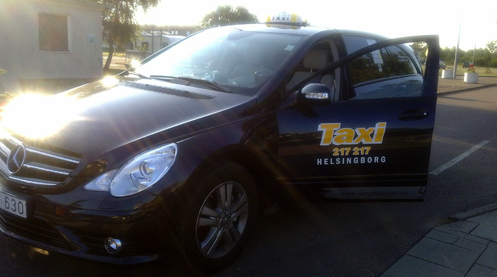 Taxi 217 217 is at the forefront in terms of traffic management systems. All cars have alcohol locks and on demand access to the car seat. Taxi 217 217 cars are also equipped with security cameras. Our cars are easy to recognize, have a uniform design, our drivers wear a uniform dress and always carry their ID visible in the car. You should be able to trust that it is a car from Taxi 217 217 you can step in to. We have realized the importance of a work that not only respects the environment, but we are also working actively to improve it. Taxi 217 217 applies an effective GPS management systems, which means that we always send the car geographically closest to you. Thanks to the system with GPS the navigation system minimizes any empty runs. We at Taxi 217 217 set the bar high and our goal is that all our cars will be eco 2011. All vehicles comply with minimum environmental requirements in 2005 or 2005 PM. Call us for free: Click here!